ggThe modern era of total knee arthroplasty began with Gunston’s report in 1971 of his experiences with minimally constrained total knee components. His design consisted of steel surfaces articulating with two high-density polyethylene surfaces. The components were fixed in bone by polymethylmethacrylate. Many hinged prostheses were developed, like the Sheehan and Guepar prosthesis in the early 70’s. These designs had a high rate of complications, occasional breakage of the implant, early wear and loosening. In 1975, Pappas and Buechel designed a low-contact-stress (LCS) knee to replace the tibial, femoral and patellofemoral articulation. Mobile bearing and rotating platform knee replacements were designed to minimize wear and loosening problems. In 1971, Freeman and Swanson used the Imperial College London Hospital (ICLH) knee, in which both cruciates were sacrificed and the implant relied completely on component geometry and soft-tissue balance to provide stability. Certain aspects of the technique of this implant are still used today, like geometrically patterned resection of condylar bone, maintenance of a large contact area to minimize polyethylene wear and reliance on medial and lateral soft tissue for stability. However, this implant failed because the tibial fixation peg was too short and there was no provision to prevent medial-lateral translation. Between 1970 and 1973, designs emerged that emphasized preserving the cruciates to ensure knee stability. Averil generated a geometric prosthesis, made of chromium and cobalt. The feature of the design was conforming geometry of the femoral and tibial components to reduce stresses in the polyethylene. In 1971, the first duocondylar knee was implanted and in 1974, the first total condylar knee was introduced. The features of this design are multiple radii of curvature, following more closely the anatomical shape of the human condyles, and replacement of the trochlear groove and patella. The load-bearing surface of the tibial and femoral components had round-round geometry in both coronal and sagittal planes. Today total condylar has become a generic term to describe a surface knee replacement that provides patellofemoral resurfacing and has a single piece tibial component with a central stem. In 1975, the first uncemented resurfacing knee arthroplasty was performed. 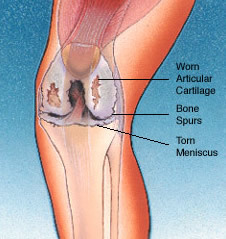 Most of the knee designs used today are similar to the early total condylar prosthesis. By the 1980s and 90s, surgeons became aware of the importance of attaining correct limb alignment and anatomically balanced knee ligaments. These are important to properly distribute weight-bearing and other forces on the surfaces of the implants, reduce wear, enhance kinematics and increase range of motion. Improved instrumentation was developed to meet these goals in a consistent manner . Metal-on-metal bearings to surface arthroplasty followed the re-introduction of metal-on-metal bearings to total hip arthroplasty in Europe in 1988. The measured wear of first generation metal-on-metal retrievals of these implants has been reported to be only a few microns per year. Unlike the adverse effects of increased volumetric wear of polyethylene as a function of increased head size, the wear is minimally affected by increasing the head size in metal-on-metal components . Ceramic surfaces and zirconium alloys are being used and tested more widely. For a more information on metal, ceramic and zirconium joint surfaces, see the materials section of the website.